Rice, Osaka scientists use terahertz waves to spot contaminants of graphene; Indiana University chemists demonstrate ‘bricks-and-mortar’ assembly of new molecular structures. Graphene may be tough, but those who handle it had better be tender, according to researchers from Rice University and Osaka University who have come up with a simple way to spot contaminants given that the environment surrounding the atom-thick carbon material can influence its electronic performance. It is so easy to accidentally introduce impurities into graphene, which is what led the physicists to develop a way to detect and identify out-of-place molecules on its surface through terahertz spectroscopy. The finding is expected to be important to manufacturers considering the use of graphene in electronic devices. Even a single molecule of a foreign substance can contaminate graphene enough to affect its electrical and optical properties, the researchers said. This, unfortunately — and perhaps ironically — includes electrical contacts. In order to measure conductivity in a material, traditionally, one had to attach contacts and then do electrical measurements, but the new method is contact-less possible because the compound indium phosphide emits terahertz waves when excited and the researchers used it as a substrate for graphene. 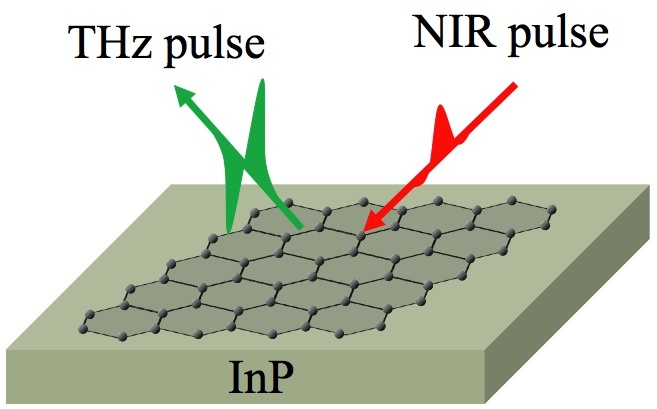 Hitting the combined material with femtosecond pulses from a near-infrared laser prompted the indium phosphide to emit terahertz back through the graphene. Imperfections as small as a stray oxygen molecule on the graphene were picked up by a spectrometer. The researchers said these experimental results are a warning for electronics manufacturers that for any future device designs using graphene, the influence of the surroundings has to be taken into account. Graphene in a vacuum or sandwiched between noncontaminating layers would probably be stable, but exposure to air would contaminate it, they concluded. With potential value for the field of organic electronic devices such as field-effect transistors and photovoltaic cells, chemists at Indiana University Bloomington have described the self-assembly of large, symmetrical molecules in bricks-and-mortar fashion. The researchers have demonstrated the self-assembly and packing of a five-sided, symmetrical molecule, called cyanostar, and while researchers have created many such large, cyclic molecules, or macrocycles, cyanostar is unusual in that it can be readily synthesized in a “one pot” process. Cyanostar also has an unprecedented ability to bind with large, negatively charged anions such as perchlorate. The future of organic electronics will rely upon packing molecules onto electrode surfaces, yet it has been challenging to get packing of the molecules away from the surface, the researchers said. The research suggests a collaborative effort as a new foray to achieve this goal using a bricks-and-mortar approach.